Polus Center and it’s Lake Kivu Coffee Alliance partners, Higher Grounds Coffee, and U.S. State Department’s Bureau of Political-Military Affairs/Office of Weapon’s Removal and Abatement, are helping coffee producers like Cifa (below) who have been injured by landmines and other explosive remnants of war by providing much needed support and rehabilitation. For farmers like Cifa, living in the Democratic Republic of Congo’s Lake Kivu region, who rely on coffee as their sole cash crop, becoming injured is often less about the injury, and more about losing their livelihood. They just want to be able to support their families, provide an education for their children, and improve their lives. Cifa, a 38-year-old coffee producer and ERW survivor, has a below elbow amputation on her right arm. She is married with three children who all work on the farm because she does not have enough money to pay for their education. The Lake Kivu Coffee Alliance addresses the impact of ongoing unrest and armed conflict in the DRC which was once a burgeoning coffee producing region. This public and private partnership aims to promote peace and prosperity through the cultivation of this re-emerging coffee industry. Since 1979 Polus Center has supported people with disabilities and has provided rehabilitation and economic opportunities for victims of landmines for over 20 years. We have developed partnerships with the coffee industry through the Coffeelands Trust. This puts us in a unique position to work towards integrating conflict victims into the coffee value chain by caring for their medical needs and providing support and job training. 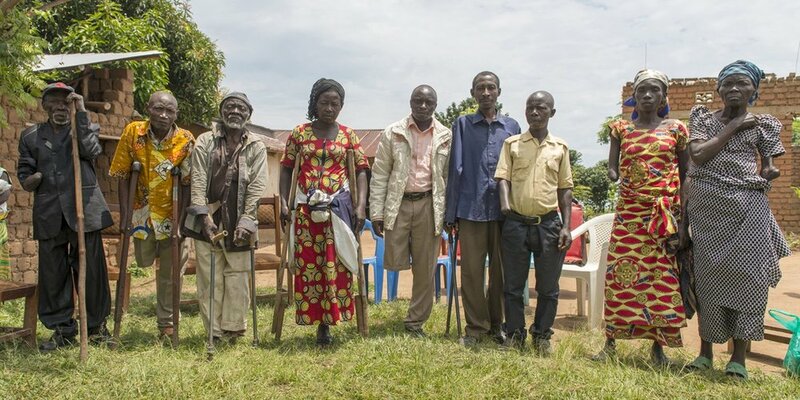 During the first six months the Alliance provided urgent prosthetic training , artificial limbs, and rehabilitation services to coffee farmers, many of them women, injured by landmines/ERW while cultivating their landin eastern DRC. We trained prosthetic technicians at the Centre Por Handicapes Physiques (CHP), provided prosthetic devices, wheelchairs, and provided peer-to-peer support for survivors. The ultimate goal is to have a socially inclusive, equitable coffee chain. First, by supporting coffee farmers who are landmine victims and second, by redesigning coffee processing facilities using Universal Design principals to increase job opportunities for landmine/ERW victims. This way we hope to encourage peace, stability and better livlihoods for coffee farmers, their families, and local communities. Lake Kivu Coffee Alliance is a partnership between the Polus Center for Social & Economic Development, Inc., Higher Grounds Coffee, and the Department of State’s Bureau of Political-Military Affairs, Office of Weapons Removal and Abatement. The P3 Impact Award recognizes public-private partnerships (P3s) that are working to improve the lives of people, their communities, and the world in important and impactful ways. The award was created by Concordia, the University of Virginia Darden School Institute for Business in Society, and the U.S. Department of State's Office of Global Partnerships.